Item # 266247 Stash Points: 995 (?) This is the number of points you get in The Zumiez Stash for purchasing this item. Stash points are redeemable for exclusive rewards only available to Zumiez Stash members. To redeem your points check out the rewards catalog on thestash.zumiez.com. 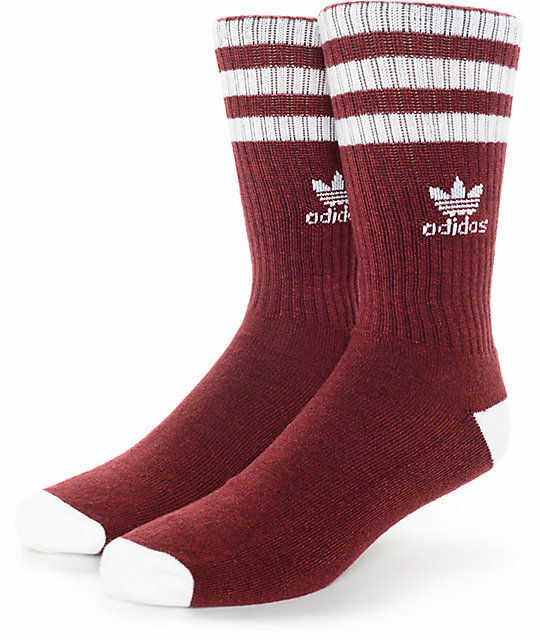 Add some color to your feet with these Original Roller burgundy and white crew socks by adidas. These socks are made to keep your feet extra cozy while the moisture wicking material will keep your feet dry. Original Roller Burgundy & White Crew Socks by adidas. 83% acrylic, 15% polyester, 2% spandex.